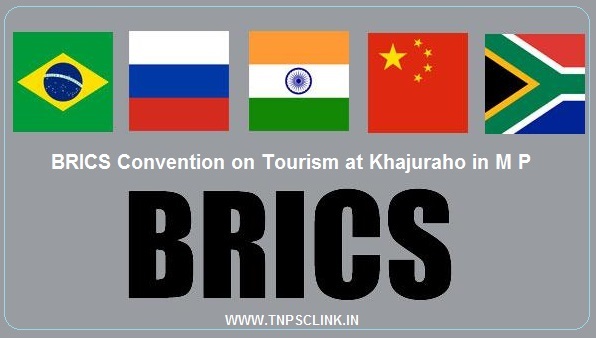 The two day “BRICS Convention on Tourism” will begin at world heritage site Khajuraho in Madhya Pradesh on 01.09.2016. Union Minister of State for Tourism and Culture Dr. Mahesh Sharma will inaugurate the convention. Delegations from the BRICS countries India, Brazil, Russia, China and South Africa will participate in it. The event will comprise of inter-governmental exchange of views and ideas and panel discussions on different subjects including cooperation between the BRICS countries for promoting intra-regional tourism. Business to Business meetings between the India Travel Trade and their counterparts from the BRICS countries will also be organised. Elements of Culture, handicrafts and cuisine from different regions of India will be showcased during the convention. The convention is being organised as a precursor to the The BRICS Summit to be held in Goa inn October this year.